On the whole the Wheaten Terrier is a healthy and robust dog, but does have genetic predispositions to certain diseases. Although it is important that owners are aware of these, it must be remembered that the majority of Wheatens live long and active lives. It is important that owners learn to recognise the signs of the diseases that may affect their Wheatens'. In this way the chances of catching a disease in its early stages are increased and therefore the opportunity to do something to prevent the situation from becoming any more serious or life threatening may present itself. Read the material available on Wheaten health and canine health in general. Learn the symptoms of those problems that could affect your dog's health. Test your dog to establish the baseline and then test on a regular basis (annually, if possible). Learn how to monitor your Wheaten's health i.e. the various tests you can do. Familiarise yourself with the purpose of each test and learn what each result means. Every dog is individual and what may be considered "normal" for one dog may differ slightly for another. If you were to compare any of your dog's test results, including temperature and respiration rates, with another owner's results, you might find this was the case. However, any large discrepancies in values may need further investigation. A first blood/urine test you will establish a baseline for your dog and each test after can be seen as a "snapshot" of your Wheaten's health. In order to monitor your dog's health correctly, it is important to ask for a copy of the test results from your vet and to keep them on file (or use WatchDog*UK Health Tracker), so that you can compare later test results with earlier ones. In this way you will be able to identify any variations in your Wheaten's health, but bear in mind that your dog could just be having an "off" day at the time of the test. However, if later testing shows a developing trend, you would be wise to consult your vet. See also the Grooming and Care - Basic Guidelines page for more information. Try to develop a good working relationship with your vet. 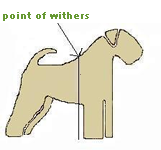 When choosing a vet ask if they are familiar with the Soft-Coated Wheaten Terrier and its medical conditions. A copy of ‘Testing Protocols’ should be taken to your Vet and you should ask if they are able to follow these Breed health protocols. If your vet is not familiar with the breed, suggest that you could provide further information on Wheaten health issues. Keep records to ensure that testing takes place annually. The following sections show basic parameters. The average canine gestation period is about 63 days. A dog's body temperature is usually measured using a rectal thermometer and can vary between 37.2°C to 39.2°. This can be dependent on a number of reasons; emotional state, level of activity, environment and even time of day. But temperatures outside these values do not automatically indicate that a disease or a disorder is present. However if your dog's temperature drops below 37.2°C (99°F), or rises above 40°C (104°F), then this is cause for concern and you should contact your vet immediately. Dogs do not have sweat glands, other than on their footpads, they have to pant in order to reduce their body temperature. However panting would not help in reducing the dog's temperature if it is suffering from heatstroke. 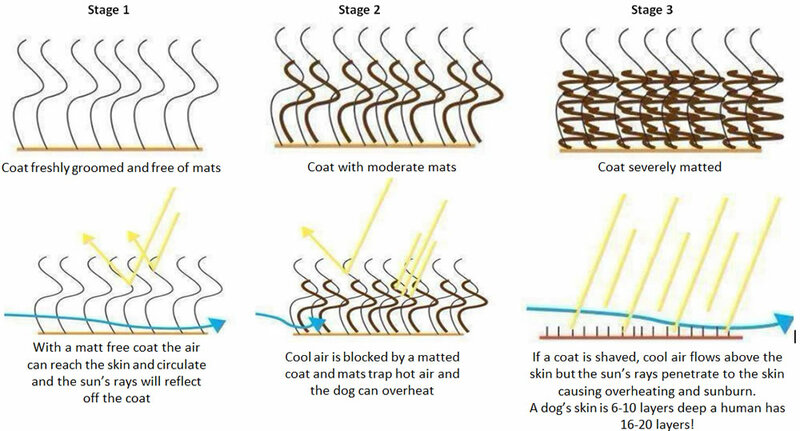 Remove your dog from direct sunlight and establish a good flow of air around the dog - use an elctric fan if possible. The dog should not be immersed in ice or ice-cold water. To decrease the dog's temperature use cool water and damp cloths or a spray bottle if available, particularly under the front armpits, the groin and the flanks. When the dog's temperature has decreased to 39°C (103°F) or below, take the dog to the vet as soon as possible, so that the core body temperature can be assessed and veterinary treatment given. Never leave your dog in a car on hot day. This link is to an article which provides more information (opens in a new page). Also watch this video from the Kennel Club. Pulse rate is the number of heart beats per minute. Larger dogs have slower rates than small dogs, and dogs that are in good physical condition will have lower heart rates than dogs of similar age and size who are not physically fit. Puppies typically have higher heart rates, up to 180 beats per minute is normal up to one year of age. Respiratory rate is the number of breaths per minute. Normal respiratory rates are assessed when the dog is resting. A dog that is in pain, having heart or respiratory problems, suffering from heatstroke, or simply excited, will usually have an increased respiratory rate. Assess at the overall situation and condition to make a proper assessment. A healthy dogs blood pressure should be around 147/83. A reading of around 170/110 indicates hypertension (high blood pressure) and Veterinary help should be quickly obtained. Courtesy of Wikipedia, a graph gives rough comparisons of dog to human ages. Graph of approximate dog years compared to human years (defined as how much each species ages in a year), allowing for differing sizes of dog. For data sources click here. 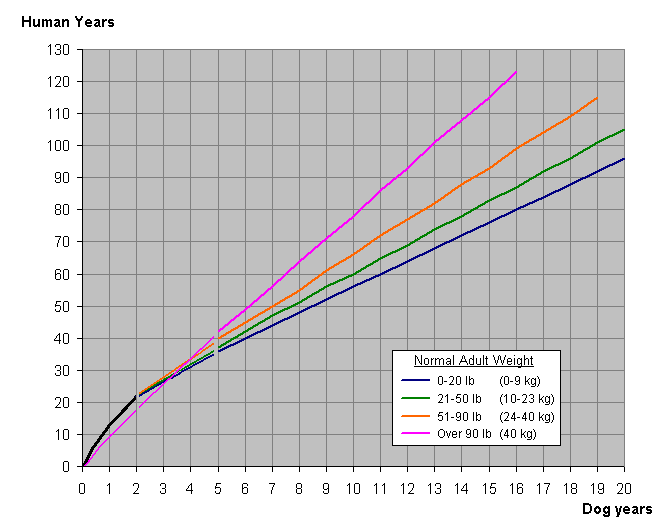 The green line would be within the weight range for a Wheaten, so, for example, a Wheaten on its 15th birthday would roughly equate to an 83 year old human.